Компания привлекает инвестиции по принципу crowdfunding (с миром на нитке) и привлекает деньги для привлечения одного и того же трафика. Темы трафика очень разные, например, из автомобилей, в туризм и книги. Однако самое главное, что все субъекты полностью законны и не противоречат законам стран, в которых компания покупает и продает трафик. Компания продает трафик на проверенные партнерские программы, будь то оплата за покупку товаров или оплата за клик (система PPC). 02.12.17 15:48 Transfer Sent Payment: 130.00 USD to account U14558575 from U1294xxx. Batch: 197096844. Memo: Shopping Cart Payment. 05.12.17 10:45;Account;Receive;Received Payment 1.43 USD from account U14558575 to account U1294000. Batch: 197379637. Memo: API Payment. Withdraw. 06.12.17 11:56;Account;Receive;Received Payment 1.43 USD from account U14558575 to account U1294000. Batch: 197507047. Memo: API Payment. Withdraw. 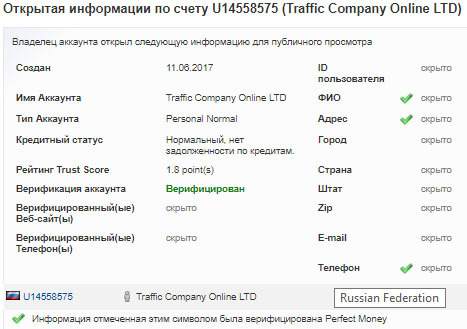 07.12.17 11:16;Account;Receive;Received Payment 1.43 USD from account U14558575 to account U1294000. Batch: 197618642. Memo: API Payment. Withdraw. 08.12.17 10:55;Account;Receive;Received Payment 1.43 USD from account U14558575 to account U1294000. Batch: 197724065. Memo: API Payment. Withdraw. 09.12.17 10:32;Account;Receive;Received Payment 1.43 USD from account U14558575 to account U1294000. Batch: 197824774. Memo: API Payment. Withdraw. 15.12.17 10:29;Account;Receive;Received Payment 1.43 USD from account U14558575 to account U1294000. Batch: 198501950. Memo: API Payment. Withdraw. 16.12.17 09:57;Account;Receive;Received Payment 1.43 USD from account U14558575 to account U1294000. Batch: 198604627. Memo: API Payment. Withdraw. 19.12.17 09:22;Account;Receive;Received Payment 1.43 USD from account U14558575 to account U1294000. Batch: 198928200. Memo: API Payment. Withdraw. 20.12.17 08:51;Account;Receive;Received Payment 1.43 USD from account U14558575 to account U1294000. Batch: 199035164. Memo: API Payment. Withdraw. 21.12.17 12:02;Account;Receive;Received Payment 1.43 USD from account U14558575 to account U1294000. Batch: 199189794. Memo: API Payment. Withdraw. 22.12.17 09:33;Account;Receive;Received Payment 1.43 USD from account U14558575 to account U1294000. Batch: 199287917. Memo: API Payment. Withdraw. 23.12.17 07:59;Account;Receive;Received Payment 1.43 USD from account U14558575 to account U1294000. Batch: 199393800. Memo: API Payment. Withdraw. 26.12.17 11:41;Account;Receive;Received Payment 1.43 USD from account U14558575 to account U1294000. Batch: 199762547. Memo: API Payment. Withdraw. 27.12.17 09:44;Account;Receive;Received Payment 1.43 USD from account U14558575 to account U1294000. Batch: 199863898. Memo: API Payment. Withdraw. 28.12.17 11:48;Account;Receive;Received Payment 1.43 USD from account U14558575 to account U1294000. Batch: 199975358. Memo: API Payment. Withdraw. 29.12.17 09:59;Account;Receive;Received Payment 1.43 USD from account U14558575 to account U1294000. Batch: 200049079. Memo: API Payment. Withdraw.